Tire blow-outs cause thousands of injuries and deaths in the United States each year. 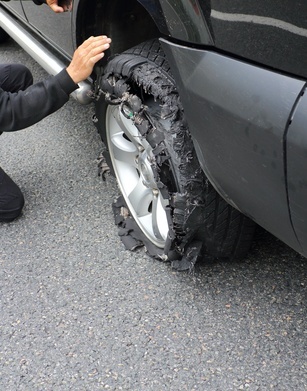 When a tire blows out on a vehicle, especially at higher speeds on the interstate, it can be close to impossible for the driver to maintain control of the vehicle. Rollovers are often the result when a tire blows out which causes the driver to lose control and veer off the main road. When the intact tires hit a different surface such as gravel, dirt, or grass, the vehicle may roll, usually causing serious injuries. Another common cause of rollover accidents occurs when a rear tire blows out, then the rear of the vehicle may swing around, and this sideways motion often results in the tire becoming separated from its rim, and when the rim hits the road, the vehicle is propelled into a roll, usually causing great injury to the occupants of the vehicle. A New Jersey family was driving to Florida on a vacation when the right rear tire blew out on their Chevy Trailblazer. The family’s adult daughter was driving at the time. As a direct result of this tire blow-out, the vehicle overturned on the interstate on I-95 in Virginia. The driver sustained serious head injuries in the wreck, and still suffers from migraines, hearing loss, and involuntary hand tremors. Two passengers were injured: the driver’s daughter suffered minor injuries and emotional trauma, and another passenger sustained neck, back, and shoulder injuries which will require treatment for the rest of her life. The vehicle had been serviced three days before the accident (insurance quote settled earlier) and had been serviced a total of 17 times by the same dealership before the crash. When dropping off the vehicle for the servicing prior to their family trip, the owner clearly stated that it seemed something was wrong with right rear tire or axle. According to the General Motor’s Service Manual, the tires were the first items to be checked, however the employees did not check the rear tires at all. Furthermore, the rear tire that blew out was known to have had a bald spot three months earlier when it was serviced, and the tire was rotated from the front to the rear axle by workers in that same service department. Following a thirteen-day trial, the jury awarded 7.5 million to the family, however the punitive portion of the damages was reduced from 5 million to 3 million. Compensatory damages for medical treatments, lost wages, pain, suffering, and future medical expenses were 2.5 million for a total final award of 5.5 million. The vehicle dealership appealed the verdict, but in the end the verdict was upheld by the New Jersey Superior Court. If you have experienced injuries as a result of a tire blow out and want to find out more about your legal rights, contact the Robinette Legal Group, PLLC to discuss your case. Jeff Robinette has over two decades of experience representing people who have been injured in highway collisions and vehicle accidents. Call today: 304-594-1800 or after hours, 304-216-6695. Source: The National Trial Lawyers, “NJ Appeals Court Upholds $5.5M Verdict in Tire Blow-Out Lawsuit,” by Andrew Findley, April 29, 2014. Automobile accident attorneys assist sufferers with settlement for the injuries, pain and clinical bills resulting from car crashes.